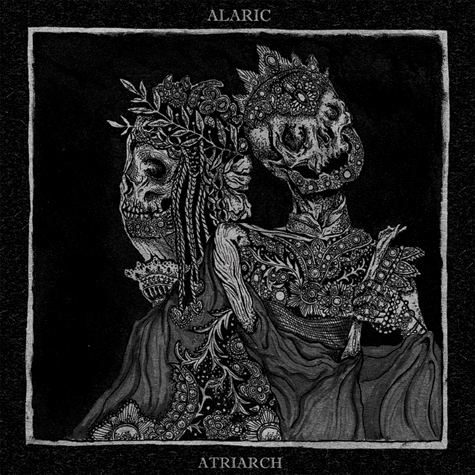 A new inclusion to my ever-expanding wishlist, the Alaric/Atriarch split LP, which will be out in the middle of May, is a fascinatingly dark and dimensionally charged rock album, each band complimenting the other with its own distinct and strange understanding of how to translate its influences. Alaric, in particular, is damn near post-punk, the band’s delivery allegiant to the likes of Joy Division or Bauhaus, if you could imagine either band being interpreted by Saint Vitus or even Flipper. Atriarch, their guitar solos cold and remarkably isolated or distant, carry an air of foreboding doom, their sound comprised of shrieking black metal and steady drones. The song selections are perfect for this type of release, demonstrative of what each band has to offer while unified in the effort’s presentation. Read up on the release and check out the videos, which have been provided by Earsplit PR. Live dates promoting the release are upcoming, but none for us on the East Coast. Weak. In support of the previously announced forthcoming split LP between Oakland's anarcho death rock outfit ALARIC and Portland's blackened death/doom unit ATRIARCH, both bands will kick off a pre-release tour tonight in Seattle. Following tonight's kickoff performance the two acts will then traverse south down the West Coast performing together over the next five days. Set for worldwide release on May 15th (not 4/17 as initially announced) the split LP offers three new ALARIC tracks on the A-side and two from ATRIARCH on the B-side, making for nearly a half-hour of brand new material as both bands are diligently crafting their next full-length releases for later this year. ALARIC released their self-titled debut LP via 20 Buck Spin in October 2011 to incredible critical acclaim worldwide, the band's infectious execution of coalescing classic dark anarcho punk, new wave and Goth influences into their own unique entity, both haunting and instantly memorable. Some called it the album Amebix should have made. Zero Tolerance Magazine proclaimed without hyperbole, "Morbid, threatening and obsidian... Album of the Year by a long shot." Portland's ATRIARCH released their debut LP Forever The End in 2011 via Seventh Rule. A harrowing amalgam of death rock, black metal and doom, the band were quickly considered one to watch. Featuring past members of 20 Buck Spin alumni Graves At Sea and Trees, the band is currently in the studio recording their second LP and first for Profound Lore.